When I was doing some quick research on espresso makers, I found out a very interesting thing (to me) about the Nespresso Pixie - they offer collecting and recycling of the used capsules in their brewing. I gathered this information from the Nespresso website online and was up to date as of this posting. "The pods are easy to use and can be recycled." The Nespresso capsule recycling program has been designed to provide convenience for our Club Members while ensuring that capsules are properly recycled at their end of life. Due to the complexities of the recycling process and inconsistent recycling infrastructure across the United States, we believe a dedicated recycling program separate from local curbside collection is currently the best way to ensure that capsules returned by our Club Members can be traced throughout the recovery process. Both the OriginalLine and the VertuoLine capsules are accepted for recycling. As we continue to grow in the US market, we will continue to work to expand our capacity to recycle, to explore innovative programs that increase awareness and convenience, and to continually increase the number of capsules recycled. Recycling is one of the areas that Nespresso is committed to as part of its overall sustainability commitments. Custom-designed plastic recycling bags are provided to Club Members free-of-charge for storing used capsules at home. Recycling bags can be ordered through the Nespresso Customer Relationship Center, online or picked up at a Nespresso Boutique. o Customer Relationship Center: Inform your Coffee Specialist that you wish to receive a recycling bag with your order. o Online: You will be prompted to add a recycling bag to your order. o Boutique: Club Members are encouraged to take recycling bags home with their purchase and will be provided recycling bags at no charge by staff when requested. We encourage our Club Members to collect their used capsules at home in a dedicated container or Nespresso recycling bag and return them to their nearest Nespresso Boutique. Many of our Club Members find it convenient to drop off their used capsules when they come to the Boutique for their next purchase. The Boutique team will consolidate capsules returned from Club Members and send them to our partners for separation and recycling. In collaboration with our retail partners, such as Sur La Table, Williams-Sonoma and many others, Nespresso collects used capsules in nearly all 50 states. You can find out more about this program or any updates to locations and collections on the Nespresso website here. This is a post I've had in my files waiting for me to finish writing it... which I'm buckling down to do today! You would think with all the coffee brewers and makers I own, I might have something like this but nope. I do not own a Nespresso Pixie Espresso Maker. But my espresso maker is no longer made (see below in the list of products) so when mine gives up the ghost or I am in the market for a new one, this one is looking pretty good to me so I've decided to feature it on Coffee Talking. When I started to research the Nespresso Pixie Espresso Maker, I was seeing some mixed reviews. Most people really seemed to love it and were steadfast fans of this brand and style. Many of the people who purchased this item did so after having it at a friend or relatives' home. That is pretty impressive because when you like something enough to purchase it yourself, that's the best kind of recommendation you get. Domestic Shipping: Item can be shipped within U.S. and various countries outside the U.S. Looking at a few places online you can purchse the Nespresso Pixie, I found the going price seemed to be the retail price; $279. This was also true on the Nespresso website. However, as of this posting the price on Amazon was only $251.68 and they offer free shipping. Now let's talk about the random reviews I found about things people didn't like about this product. "The coffee was not hot enough, the milk didn't foam well"
Why is this interesting to me? Because none of the other reviewers mentioned this. At the time of researching this product there were almost 230 reviews and although I obviously didn't read them all, the 30 or so I looked through didn't mention this. I suspect perhaps it's the type of milk used. A whole milk is going to froth so much better than a fat free or 1%. I have no idea what kind of milk they were using (they never said). This little feature ended up not being a problem at all! "Recently the amount it brewed per serving became too short only brewing half what it did before. On the web site Nespresso has a video on how to correct that. Basically you just hold the coffee section button down one time to adjust the normal coffee (Lungo) button, to brew as much coffee as you like per lungo pod. What I thought was a problem is actually a nice feature as you can brew coffee to your taste (not some preset.)" "I find that the Ristretto (black capsules) work best for lattes and cappuccinos. It is a dark and rich coffee that can handle the dilution with milk. My favorite straight espresso is the Volluto (gold capsules). It is creamy, strikes the right balance between bold and mild and is a crowd pleaser." I want to get to a really important feature of this product but this post is going to be a NOVEL in length if I do so I'm going to break this product review into 2 sections. Here I will the first, simply for length's sake. The next installment is going to be a HOT topic - THE PODS! A major source of contention with these single brewers is the trashy piles of k-cups we as a general population are leaving behind as the Keurig brewers have invaded our lives. HUGE HOT ISSUE. So why bring this up when discussing the Nespresso? Because I found out Nespresso actually recycles their pods - and wants to help you do so too. Kudos to them! So that will be installment number two. Coming soon! You that little saying "No good deed goes unpunished"? Well, this is kind of, sort of like that. In a very tiny way. You see, while be-bopping around the net I saw these yummy cupcakes - COFFEE inspired - so I thought; OH, I WILL FEATURE THEM ON COFFEE TALKING. Readers would love to make these little guys. And I thought it would be simple. But it wasn't. Because as I clicked on the recipe to give credit to the author, I found that the photo was by the author, who used another sites recipe for the cupcake portion - but that person's site admitted they used someone else's recipe, which was heavily adapted from yet another site. It was like a internet scavenger hunt. In the end, here are the places I had to dig through and apparently everyone threw in their own little version. and noted their recipe was "heavily adapted from Apartment Therapy's The Kitchn"
But here's the deal.... you can use ANY CUPCAKE RECIPE. 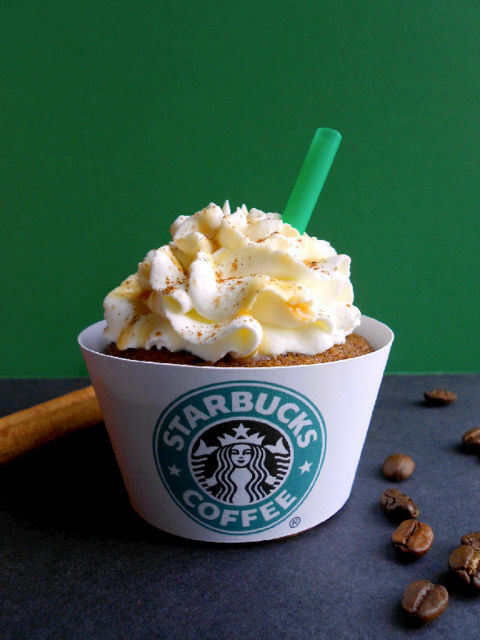 This is just a typical, regular, boring, basic recipe - but they added some espresso powder or instant coffee to it. 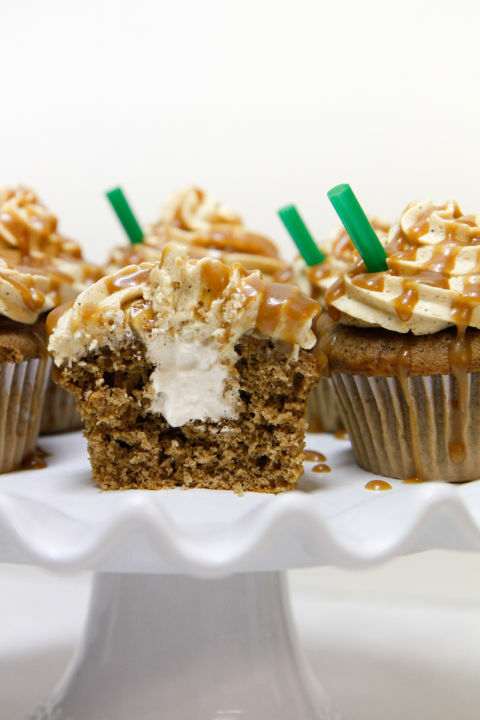 The fact is - it's a regular cupcake recipe, with some instant coffee, and then the whipped cream center and a yummy basic buttercream frosting with (again) an addition of a little bit of coffee to it - and drizzle it with some store bought caramel ice cream syrup. Preheat the oven to 350°F. Line 12 cupcake wells with paper liners. Sift together the flour, baking soda, baking powder, and salt. Stir in the instant coffee or espresso powder. Using an electric mixer on medium speed, beat the butter with the granulated sugar until light, 1 minute with a stand mixer or 2 minutes with a handheld mixer. Add the eggs, one at a time, beating well after each addition. Continue to beat the mixture for 1 minute with a stand mixer or 2 minutes with a handheld mixer. On low speed, alternately add the dry ingredients and the milk in 2 additions, stirring until incorporated after each addition. Pour the batter into the paper-lined cupcake wells. Bake until a skewer inserted in the middle comes out clean, about 20 minutes. Let cool to room temperature, then remove from the pans. To assemble, core your cooled cupcakes with a paring knife or a cupcake corer. Fill with whipped cream, and add a spiral of caramel on top. Pipe your buttercream on and generously drizzle caramel all over. Finally cut up green straws into 3" lengths and point them in at an angle. I'm sipping iced coffee this morning (because it's after 11:am and I've already had 3 cups of hot, strong, black coffee so far this morning... don't judge me). 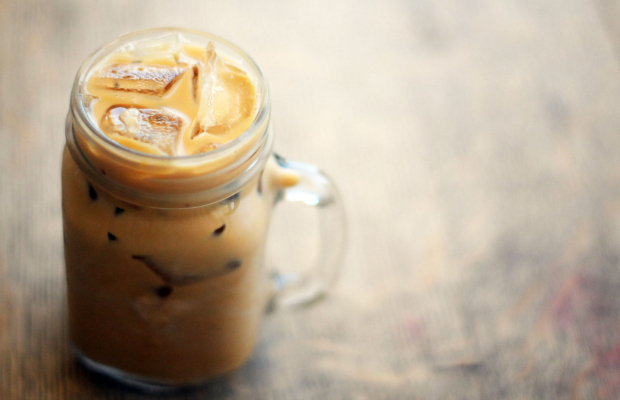 I am gearing up for a product review that involves a brand new product to make your iced coffee but that got me thinking about iced coffee in general and I stumbled upon a quick little recipe Good Housekeeping posted way back in 1957. Today I tend to make my iced coffee a variety of ways; from using leftover coffee in my mug that got too cool to drink because I was busy working and ignored it, to brewing strong espresso strength and cooling it down specifically for iced coffee or one of my summer favorites; using my Mr. Coffee 20-Ounce Frappe Maker ... yada yada. There's lots of ways. But back in the 50's most things were a little more time consuming to do... including coffee. But if you want to be authentic, and make it the popular housewife magazines instructed to do back then, here it is! In a small pitcher or 1-quart measuring cup, whisk together 1/3 cup ground coffee and 1 1/3 cups cold water until all the lumps are gone. Cover tightly and refrigerate for at least 5 hours, but it's best left overnight (not much longer or it'll get bitter). Strain the coffee through a coffee filter-lined strainer set over a tall glass of ice, pushing it through with a spatula. Reading this little article in the news this morning, I was reminded of when a similar situation happened to my husband and I. This was many years ago, when we were a young couple with a new baby, renting a home outside of Nashville, Tennessee. In our case, I had set up a pick-up date for a local charity to come to get a few items. When you place the call, they specifically ask you what you are donating and they write it on the ticket. "2 bags of clothes, 1 box of household goods, 1 chair" etc. In our case it was a couple bags of items and my directions were the 2 bags would be left on the deck at the top of the driveway. When I returned home from work that afternoon I was happy to see the 2 bags were gone and the receipt was hanging on our doorknob. However, something was 'off' so I stopped and looked around. Behind the deck, on the ground, about 4 feet below, and leaning up against our house used to be a 10-speed bike and 2 folding patio chairs. Now gone! The charity drivers not only took the 2 bags of clothing from the deck as directed to on the paper (and my receipt showed the 2 bags listed by their company for pick up) but they took it upon themselves to walk around the deck, on ground level, to the side of the house in back of the deck, to take our bike and 2 chairs. I was not happy! A call to the charity resulted in a 'eh' response. "Anything that is sitting out, gets taken" "Our drivers just take whatever is sitting there." Except it wasn't just "sitting there". These items were not listed to be picked up, and were not near the 2 bags that were. My calls got transferred to people and no one had any answers and couldn't account for it so in the end, I decided to just let it go. The bike was about 10 years old and the chairs were a couple seasons old anyway. But still... I do wonder how many people have things taken by drivers either accidentally or on purpose, as the man in the news article did. Just a quick 'heads up' that right after I posted the post below about the soup pods you can brew in your Keurig, I walked down to get our local paper and found a $2 off coupon in it for the product at your local grocery store. You might want to check your own local paper(s) to see if you have one in it, if this is something you would like to try.